We have admits ourselves a new website that allows us to make free phone calls to America and Canada. You would require a microphone, speaker, web browser and a broadband connection. You can make phone calls even if you are a not a registered user with the website. However the benefits are high when you are registered and registration is absolutely free. If I am right the site commenced its services from 18-Dec-08. Visit the site callingamerica to make free phone calls. The site is brought to you by Goober Networks inc. The site asks you to type the phone number you wish to call and requires you to view a short ad before you place the call. If you are a not registered user each phone call is restricted to 2 min otherwise registered users can make phone call up to 15 min. Its unlimited so you could make phone calls again and again. After the ad is seen and you have placed your phone call no ad’s pop up and will interrupt your phone call. What numbers can you call ? You can call land-line phones and mobile phones in USA and Canada. This is a web based so you do not have to download and install any software. 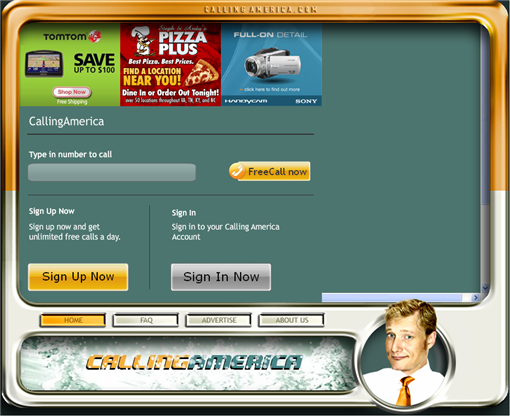 Just visit the site callingamerica and enjoy your free phone calls.